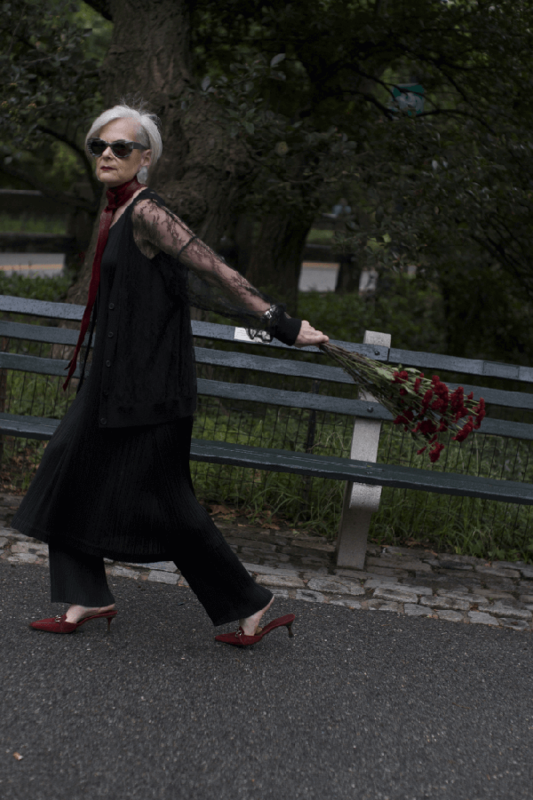 At an age when many people are thinking about retirement, Lyn Slater has launched a whole new career—as a style blogger. At 62, she's in her second year of blogging, while maintaining a successful full-time career as a professor of law and child welfare at Fordham University. Yes, we want to be her when we grow up. Slater's blog, Accidental Icon, is less than a year old, but she's already been featured on Advanced Style, has collaborated with Uniqlo, and has hinted on her Instagram (which, by the way, has 17.2k followers) that she's got something coming up soon with Refinery29. In the spare time that she somehow carves out, she's been taking classes at Fashion Institute of Technology in subjects including jewelry design, social media, styling and branding. She also loves spending with her daughter and granddaughter, and taking advantage of NYC's many art galleries and museums. Modeling, on the other hand, hasn't always come naturally. “Believe it or not I am actually a bit shy and really don’t love having my picture taken, though I have to say I am getting used to it,” she says. Read on for our interview with the Accidental Icon. 2. How did you hear about IFB and why did you decide to join? 3. How does the city you live in influence your style? 5. Can you tell us a little about where you're from originally and how you first became interested in fashion? 7. Do you blog full time? If not, how do you manage to work it into your schedule? 8. What has been most surprising to you about having a personal style blog? 9. Are you monetizing your blog? What do you find works best for you? 10. Who takes your photographs? Follow Lyn on Instagram, Twitter, and Pinterest. Ok, how amazing is Lyn and her blog?! I love her sense of style and I how fun she makes all her outfit post! Makes you feel like you’re right there. What a really fun piece. She is an inspiring woman, I love every look and all of the sunglasses. Love your Style! Way to go. So glad to read this post. One of the great motivational post indeed for everyone who thinks to retire after 62 age. Glad to know that she featured on advanced style. I sincerely appreciate her interest in taking class at fashion institute, it’s really amazing. She is a great inspirational for every women who think helpless yourself. She is looking so energetic in every picks and I got amazed looking her style and brain at this age. She is really awesome and inspirational. Her blogging is full of sense. Thanks for meeting here such a great personality. Great interview.